Ivo doesn't have much time anymore and he spends his last weeks in a hospice. He's staring at the walls and there isn't much to do except waiting for the inevitable. His nurse Sheila tells him to do the A to Z game. He has to think of a body part for each letter and then he has to come up with a story that goes with it. The game brings all kinds of memories to the surface. Ivo thinks about his family, his friends and most of all the love of his life. Unfortunately this doesn't bring him peace. His past is tragic and there's a lot he wants to forget. He refuses to see anyone any longer, but maybe visitors are what he needs even if those visits are difficult. 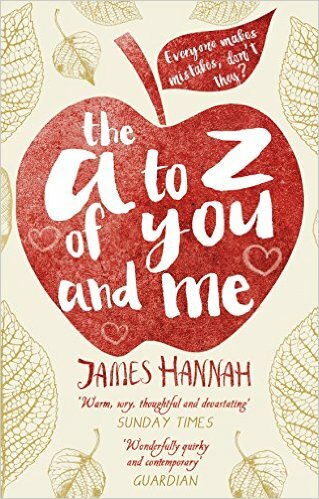 The A to Z of You and Me is a beautiful story about a dying man who hasn't always made the right choices. Ivo hasn't looked after his body the way he should have. He was easily influenced and didn't take care of himself at times. He has a story to tell, a sad and real one. I read this story with tears in my eyes. Even though Ivo is a broken man in many ways he has loved deeply. 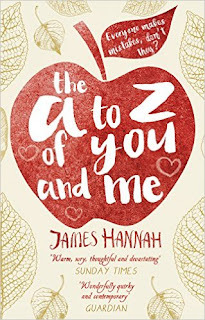 There are so many emotional layers and James Hannah has explored each and every one of them thoroughly which results in a brilliant story. He describes Ivo's illness and approaching death in a sensitive way and there's a lot of compassion, warmth and kindness in his story telling.